Rochelle Rubinstein, Wendy O'Brien, Megan Bostic, Camilla Geary-Martin, Nicole Collins, Lilly Otasevic, Susan Lukachko, Wendy O'Brien. Opening Reception: Friday Nov. 2, 2012, 7 - 9 pm. Hours: Mon. - Thurs. 10 am - 7 pm, Fri. - Sat. 10 am - 5 pm. Sun. 12 - 5 pm. The Memento mori exhibition at the Gallery at Sheridan Institute deals with themes of death, mortality and grief, and the quest for immortality. 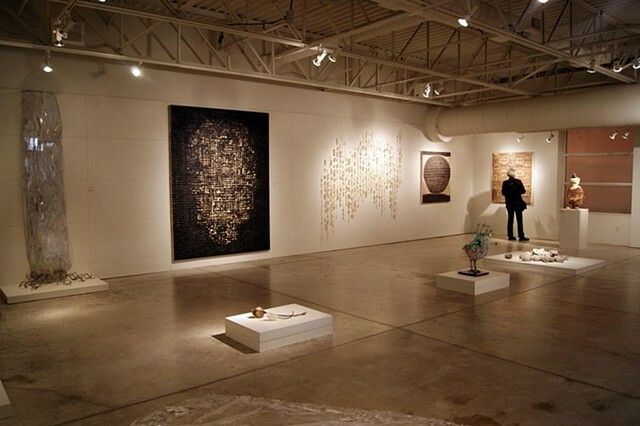 The show developed out of a call for submissions called "Fibre Inspired". The call was based on a trend Festival Curator Gareth Bate had observed in contemporary art towards creating work using the techniques and aesthetic of fibre, but using non-fibre materials. He was struck by how radically different these submissions were. They were dark both physically and thematically. The central question became why are these artists choosing to use fibre construction techniques but replacing the fragility, impermanence and tactility of fibre materials with hard, 'permanent', and difficult to manipulate materials such as stone, bronze, metal, wood, bark, ceramic, plastic, wire, solid paint and wax? The thematic darkness of the majority of submissions was also fascinating. The exhibition creates an underworld environment. Mummification is a central theme. This process attempts to preserve and make immortal the ephemeral body. The exhibition is set up in opposition to the exhibition De rerum natura (On the Nature of Things) at Joshua Creek Heritage Art Centre. That exhibition is filled with life, colour and energy. It focuses on plants, animals and nature. USA: North Carolina: Raleigh: Megan Bostic.